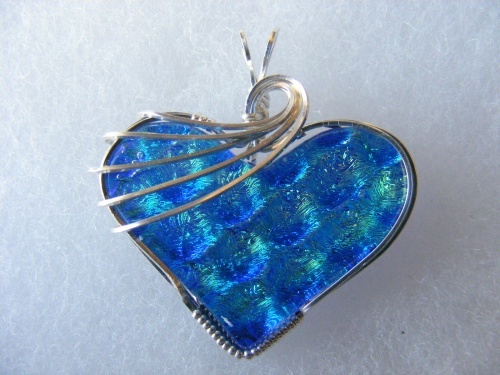 This pretty handmade dichroic glass heart is wrapped in sterling silver with swirls onamenting the top. This piece is just completely outstanding with the colors so striking, it will make you feel so attractive when worn. Measures 1 1/2" long including bail and 1 1/2 wide and comes with a sterling silver chain. Glass handmade by artist Rhonda Young.